Yes, Is True... I'm Nacho, The Luchador..... 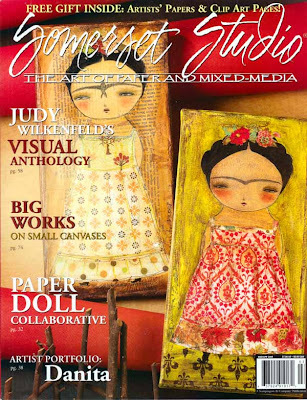 I Mean, Is True, I'm On The Cover Of Somerset Studio Magazine!!! Several months ago, I was interviewed by Rice Freeman-Zachery for the Artist Portfolio of Somerset Studio Magazine. I couldn't believe it at first. It was like a dream come true!!! I've always admired a lot the artists they feature and I never thought I was going to be one of them! I was so excited knowing that my name would be on the cover! I didn't even hoped that my art would be on the cover, because I've seen that usually what is on the portfolio is not what is on the cover. But imagine my surprise when Jenny Doh contacted me and told me that I was on the cover too!!!!!!! I almost fainted!!!!! And it was a real surprise when I received my issue. I hadn't seen a preview... I didn't even knew what piece they had chosen... and when I opened my bag and removed the white paper that is on front what did I see?... Not one, but TWO of my Fridas in there!!!!!!!! (Am I using a lot of exclamation signs? It is because I'm so excited!!!!!!!!). This is my first cover and I'm very grateful for it. 8 pages with my work in one of my favorite magazines is more than I could have asked for. Thanks so much Jenny and Rice and all you work in the magazine. It's been great working with you!!! Hi Danita, I am so happy for you. I know how you feel. I had a short story published once and it was like thunder, lightening. You never forget how you feel. This may be the beginning of things to come. Great for you. Keep up your good work. Yayyyyy! WHOOHOO!!! Congratulations! It is wonderful seeing your well-deserved success! Plus I now have another reason to buy one of my favorite magazines! Can't wait to see your featured article and your work! WOW WEEEE! That is great news! Bravo!!!!!!! Two spirited thumbs up my dear!!! I will definitely be picking that one up. Somerset is about the only magazine I buy at this time! What a wonderful thing! How absolutely fabulous for you! I'm thrilled that one of my favorite artists will be on my cover of one of my most favorite magazines too!! The spread is phenomenal and you look fantastic! Congrats!!! You must be so proud.I am truly happy for you.Heres to many more magazine covers. How Very Exciting. I was walking through the bbok atore and saw the cover of SomerSet and recognized your work. I had no idea this was coming out. Congratulations!!! I love your work, love love love it. WOW...I'm so excited FOR you...you're already "up there" with the greats...but this will just be seen by thousands...well done!!!!!!!! I hope I can get a copy up here in Canada! Oh wow-congratulations.That is so fun!I can't wait to see this magazine. WOW!!! Congratulations!!! You deserve it. HUGS!!! I can't wait to see the magazine. Congratulations! You're incredibly talented and inspiring. You deserve it! How exciting. I can not wait to get my copy. Nice job! That is incredibly, amazingly awesome!! You are such a talented, original and enchanting artist....you absolutely deserve this wonderful honor. Congratulations, Danita!!!! That is so exciting! felicidades wapisima!!!!!!!!!! te mereces esto y mucho mas! Wow!!! It's a beautiful cover, too - I'll have to go get my copy right away!!! Beautiful Frida paintings - I love them!! Congratulations!!!!!!!!!!!!!! There I used almost as many exclamation points!! :) I'm so happy for you. congratulations that is fantastic and also well deserved! Sending you a big 'well done' hug all the way from the UK!! It's such a proud moment...just soak it all in!!! Beautiful work girl! OH congratulations!!!! You so deserveit!! Have a great day. Oh I'm so excited for you! This is well deserved and I'm going to run out to Chapters to find a copy!! Congratulations...not surprising publishers love your art as much as I do!! Thanks for sharing this great news...I needed the pick me up! You so deserve this Danita! How's that for exclamation points! YEAH DANITA!! That is SO huge and it just couldn't have happened to a nicer person! Big Love for you, Danita!!! COngrats Danit, you deserve every success! The article looks great, and how about that cover! WOOHOO! Way to go Danita!! Well-desreved! So fantastic! I just came across your beautiful Etsy shop and I'm so happy to see that you are being recognized as the brilliant artist you are. All the best! Felicidades! Usted se lo merece! oh wow! !I can't wait to get a copy of this issue! You rock! Danita! I read your article in Somerset and am totally inspired and in awe of you! Such beautiful artwork! What GREAT news!!! I'm so happy for you and can't wait to see the issue for myself!! Oh Danita, you've probably read this about 41 times already but what the heck......I'm so happy for you and congratulations! You are well deserving of this honor. Your work is amazing and I love your Fridas. Good for you! Congratulations Danita...you deserve it... you are on one the most talented artists out there!!!! !Way to go girl!!!!!! WOW! Congrats!!! Fabulous work, i can't wait to see the issue! Hi Danita, I was born in Cd. Juarez, Chih. I currently live in South Carolina, my parents live in El Paso and the rest of my relatives are in Juarez. Somerset Studio is my favorite magazine and my better half gave a subscription for Christmas, I got my first issue last week, Mar/Apr 2009. I loved the cover and I immediately started reading about the artist and her work. I could not believe what I was reading, a Mexican artist from my hometown featured in one of the best inspirational magazines for creative minds, I was so exited. Congratulations! It would be my dream come true as well. WOW!!! This is wonderful!! congrats Danita!! Wow! What an honor! Can't wait to see the article! A HUGE congrats to you Danita!! You deserve it. I am off to find a copy for myself. Congratulations Danita!!! The article about you was wonderful!!! Just picked up a copy at Barnes and Noble! What a wonderful article - well deserved recognition!! Congratulations! Your artwork is awesome! Congratulations Danita! How exciting for you! Also, I loved your joke Nacho! Hey there! I just picked up this publication for the first time at Borders last night. Way to go! Your work is really beautiful and unique. THANK YOU for being you!